In my house we cook. By we, I mean I. I cook. A lot. If I am home all day I cook several meals a day. The people I live with insist on eating three times a day and most of those meals come from my hands. LOL! My husband is a newly converted vegetarian, I eat a low card diet and my kids eat whatever comes to the table. LOL! This is ok most of the time because I make the veggie meal and just add protein and leave out carbs on my plate but there are many times this is exhausting. The dishes pile up and no one wants to deal with them. Then I’m trying to cook a meal in a junky kitchen (which I hate) and then I stop cooking and start ordering pizza which the kids love but irritates my husband. 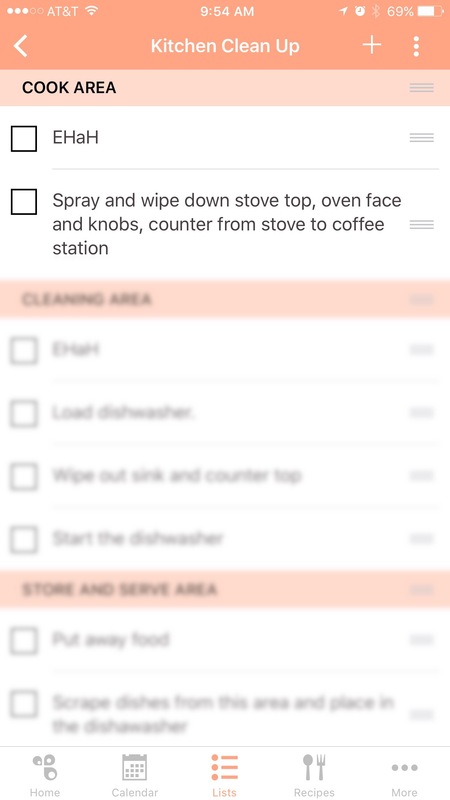 My husband recently said “I think we should start cooking and cleaning the kitchen together as a family. What do you think?” I thought “That sounds horrible” but I said pleasantly, “That’s a thought…” Then I walked away. It’s not that I don’t want help or that I don’t want people in the kitchen. I just don’t want them in my way. All I could imagine was people stepping all over one another and things taking three times longer than needed. Fast forward a few weeks and I am in the kitchen after dinner when I hear my husband call the boys. They come into the kitchen and my husband says “Ok. All of us are gonna clean this kitchen.” He then proceeds to give everyone a station. “Gabriel, you do this part. Michael you do that. I’ll do this. Babe, you ok with doing that?” I was just standing there. Like a poor little deer trapped on a highway caught in the headlights of an 18 wheeler truck. Oh. My. Word. I’m a planner. I plan. I don’t do things without a plan. This plan clearly had no plan. I started to panic a tiny bit. I could already see flaws in this unplanned event. How is Gabriel going to clean the counters if Mike is using the scrubber to wash dishes? How can I put away food? I need to get into the cabinet with the containers but can’t because you are standing there stacking dishes for Mike? Chaos I tell you!! Chaos!! It took half a second for thoughts to run-a-muck through my head then I came back to myself and realized that if I could calm-the-boot-down this might be a great idea. Unplanned, therefore most likely poor in its execution, but still a great idea! My husband is the general manager for a full-service cafe. He works in a kitchen all day! I realized…he was onto something! Stations. 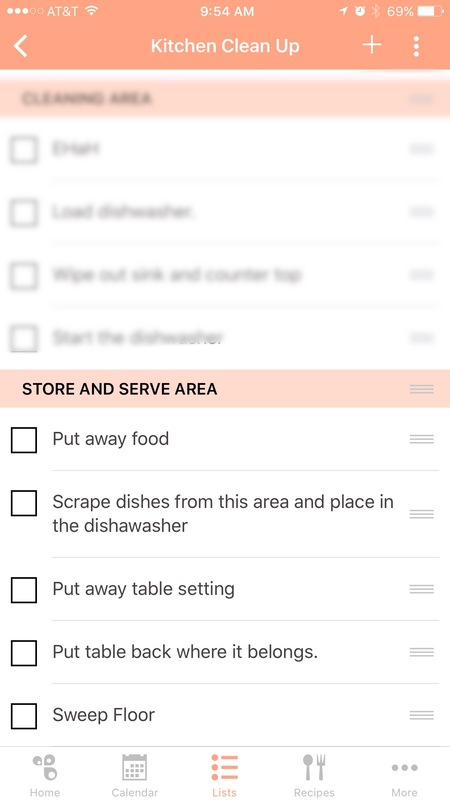 Organizing your home kitchen by stations is taking your cue from restaurants. In a restaurant everything that the person needs to complete their part in serving up delicious food, within a reasonable amount of time, is at their station. No running over to the dishwashing area to grab a spatula. Abby Stone wrote a great article for apartment therapy on the topic of stations in home kitchens. She has stations in her kitchen and even has duplicates of certain spices! She bakes a lot so she has a cinnamon in her cooking station and a cinnamon in her baking station! I like it!! 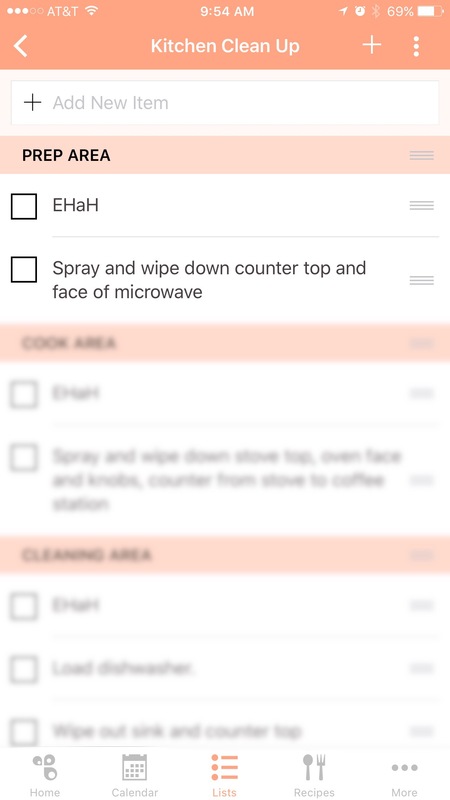 A few days after my husband’s suggestion I happened upon a list for kitchen organization and guess what? It was broken down by stations!! OMGoodness! No it was not! Yes it was!! I tweeked the list a bit and reworked it. It took time because it also meant rethinking how my kitchen was organized. Once I thought through it all I realized that it might be a viable option so I started planning a kitchen overhaul. I would break my kitchen up into zones. Four zones, to be exact. I would stock the four zones with their necessary items and then we would cook together and clean together based on zones. It took two days to completely re-arrange my kitchen. 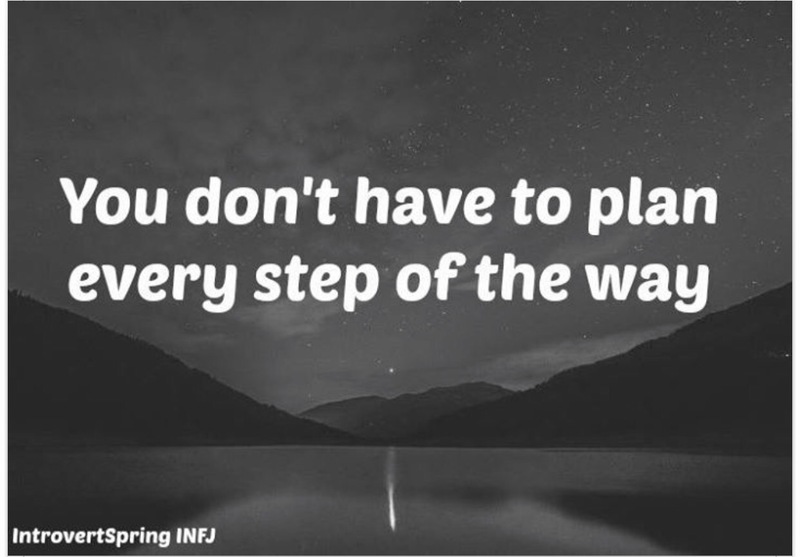 It didn’t help that I was also in the throes of the book The Magical Art of Tidying Up by Marie Kondo so I was also purging while reassigning. Madness. Beautiful madness. It’s been about two weeks since the overhaul and we’ve only cooked together a few times for various reasons like work and activities but those times have been a lot of fun! Here is a screen shot of what each station does. 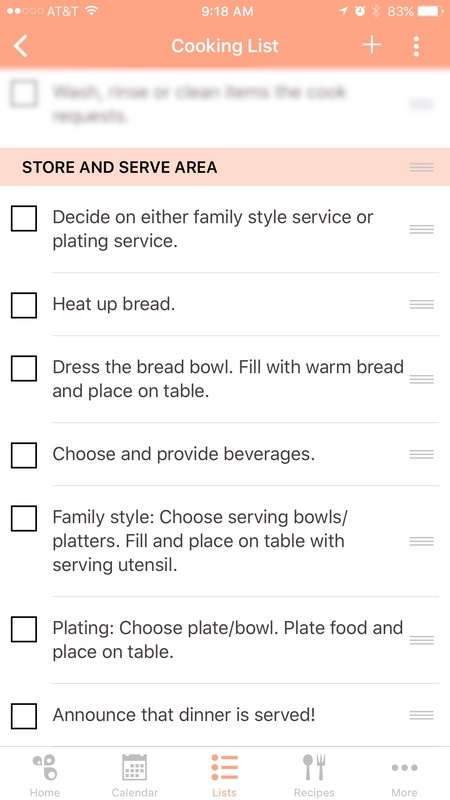 I am using the Cozi app so everyone in our family can see the lists. 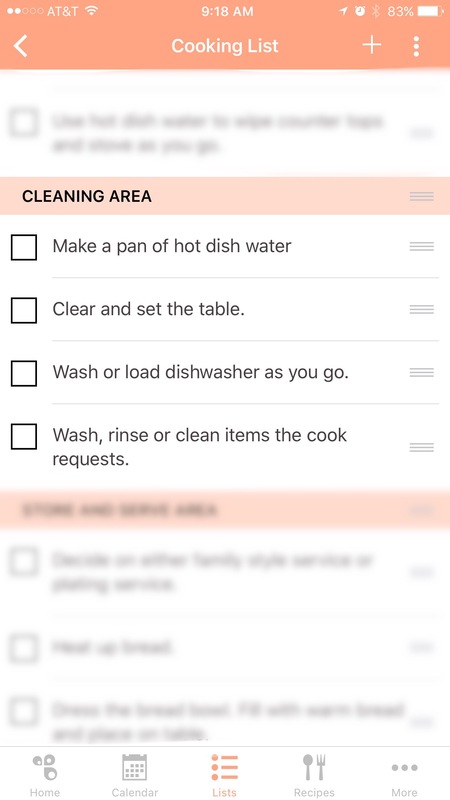 It’s a nice app for families to use for planning and organizing because lists are shared. 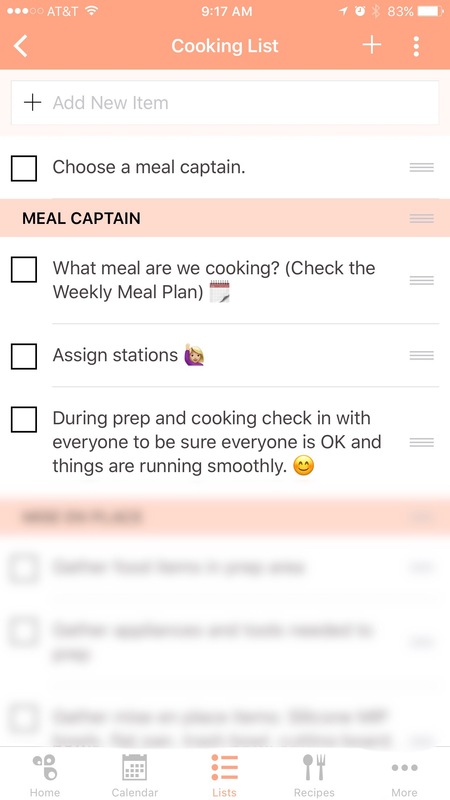 First we choose a Meal Captain. This person wears two hats, both Meal Captain and another role. They make sure that we are running smoothly and they help anyone who needs it. Next is Prep. This is new for me because I’m used to grabbing as I go. I’ve found though that this makes for easier cooking, cleaning and a better meal. Think chopped and sautéed onions and peppers in that pasta and sauce instead of just onion powder. PS. 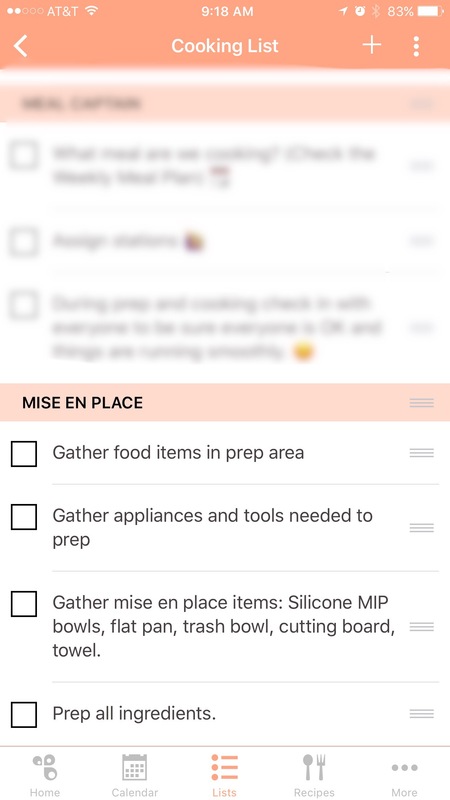 All the mise en place goes onto a cooking sheet so the cook can have everything in one place. This takes a bit of time also. Things go more smoothly and quickly if groceries have been prepped on shopping day. Like broccoli is pre washed and cut off stalks so it’s ready to join a recipe. Next is the Cook role. They get the pots and pans needed and use the prepped ingredients to cook a great meal. This is the Cleaning Role. 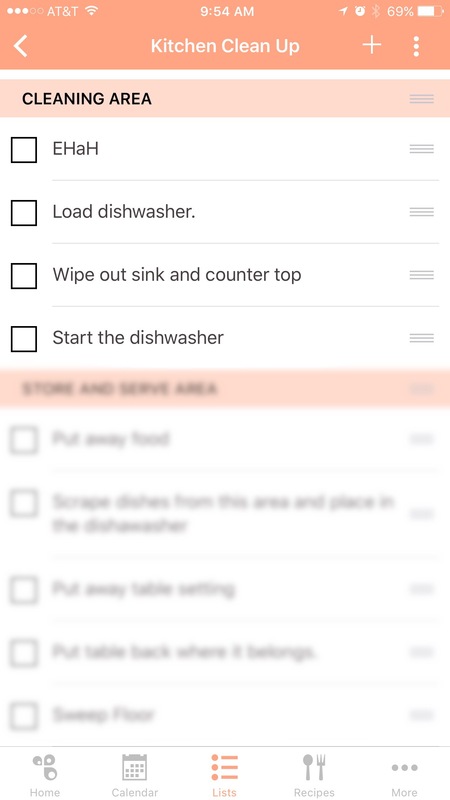 This person manages dishes used during prep and cooking by either washing them up or loading the dishwasher. Also, because their station is near the cabinet with the dishes and utensils they set the table. Everyone is expected to clear their own plate, utensils and cups once they are finish eating. Afterward we clean the rest of the kitchen. EhaH stands for Everything Has a Home. Also, each area has their own cellulos scrubbing mat to wipe down and clean with! What can I say? This is working for us. Here are some of what I’ve noticed. 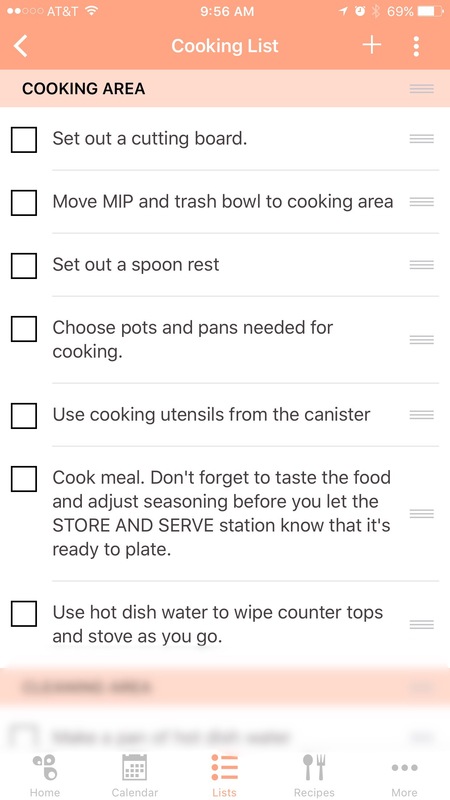 The more we cook and clean together the less we need to look at the lists because we are remembering what each role does. The kids are eating food they used to avoid because they are part of the process. Left overs are eaten more readily. I’m not sure why that is but I’m so glad. We are spending sweet quality time together. People are cleaning up behind themselves a little more when they are making snacks. The kitchen still needs pick-me-ups through out the day but it’s nothing like before! What do you think about creating stations in your home kitchen? What are some of your meal time routines? Let us know in the comments section below! Tip: Here is a great recipe for Arancini di riso. It’s easy to make, tasty and less than $1.00 per serving! Previous Post Books I am currently reading.